Boil sweet potatoes in water until tender. Drain and submerge in cold water to cool. Remove skins from sweet potatoes and place in a large mixing bowl. Add butter and evaporated milk and blend with an electric mixer until smooth. Pour filling into pie shell and place in hot oven. 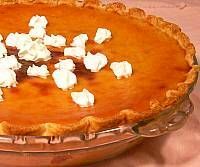 Bake 50 to 60 minutes or until a toothpick inserted into the middle comes out clean and the top of the pie is golden. Cool and serve with whipped topping.